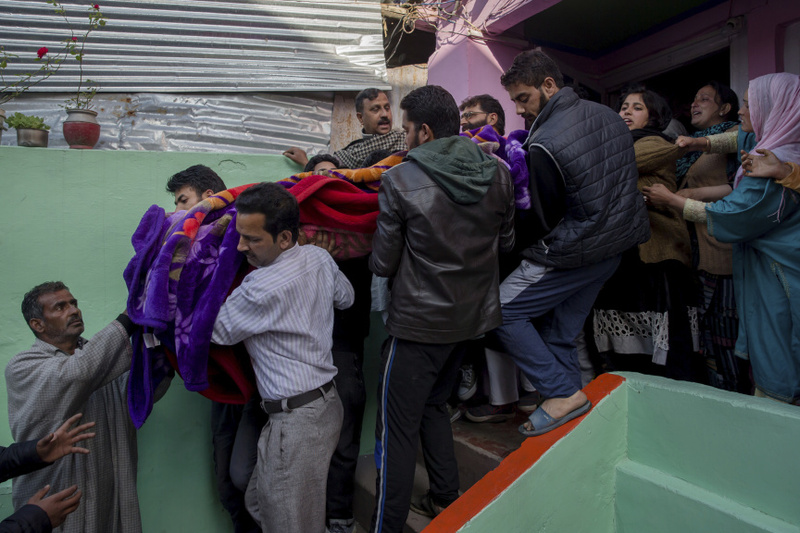 SRINAGAR, India (AP) — Suspected militants shot and killed three men in Indian-controlled Kashmir, police said Tuesday, as the disputed region observed a strike to protest the killing of two rebels and a civilian this week during an Indian counterinsurgency operation. Three suspected insurgents fired at the three local men overnight in the town of Baramulla, police said. The victims, ranging in age from 20 to 25, were shot at close range and died instantly. Baramulla is about 60 kilometers (37 miles) west of Srinagar, the main city in the Indian-controlled portion of Kashmir. No rebel group has claimed responsibility for the deaths of the men. Police officer Imtiyaz Husain said they were investigating the motive behind the killings but blamed the militant group Lashkar-e-Taiba. On Tuesday, a few hundred relatives and neighbors offered funeral prayers for the three men before their subdued burial in Baramulla. The silent and submissive tone of the burial was a signal that militants were involved in the killings. Local residents said the three men had been warned several times by rebels to sever contacts with the Indian military. Also on Tuesday, shops, schools and businesses shut across much of the Kashmir Valley to protest the killing of the two Kashmiri rebels and a civilian. Armed police and paramilitary soldiers in riot gear patrolled streets and enforced a curfew in some areas of the old quarters of Srinagar. Security restrictions were also in place in some parts of volatile southern Kashmir. The two rebels were killed and at least three soldiers wounded on Monday during India's intensified counterinsurgency operation in southern Kashmir. The civilian was killed and at least 14 others wounded when government forces fired at anti-India protesters who were trying to help rebels escape during the gunbattle. Thousands of people participated in the funeral prayers for the two slain militants at their native villages in southern Kashmir on Tuesday. Prayers were held at least five times for one of the slain militants, a top rebel commander, to accommodate the large number of people arriving from different places in the region. Mourners chanted pro-rebel and pro-freedom slogans such as "Go India, go back" and "We want freedom." The killed civilian was buried overnight. Apart from a customary religious injunction and expression of mourning, funeral prayers in Kashmir are generally a stark indicator of people's moods and political feelings. The funeral prayers for the three slain men in Baramulla and the two rebels in southern Kashmir offered a clear dichotomy. While a few hundred participated in the burial of the Baramulla men, thousands thronged the villages of the two slain rebels to pay homage. Kashmiris make no secret of their fury over killings by government forces, which regularly trigger bloody protests and demands for "azadi" — freedom — from Indian rule. But reactions are far more complicated, tangled in fear and loyalty, when residents accused of being informers are targeted. Most Kashmiris support, at least in general terms, the rebels' goals.